The evidence supporting diet’s role in chronic degenerative diseases is substantial. Clinical nutrition, or the use of diet as a therapy in health or sickness, is at the base of naturopathic medicine. At MEDICUS the Naturopathic Physicians have their fingers on the pulse of the ever-increasing body of knowledge which support the use of whole foods and nutritional supplements to maintain health and treat disease. Individualized weight loss and weight gain programmes meet with great success. 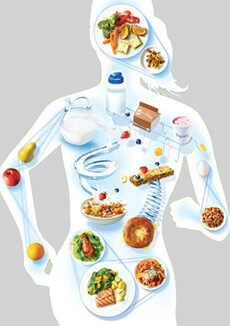 Diets which promote optimal vigour and vitality are essential for obtaining the most out of life! Specific, computer-aided calculations of body mass are an important aid in allowing the Practitioner to make an astute assessment of the patient’s requirements. These tools also allow the individual patient to progress in a self-targeted way to their best and healthy weight and shape! Your MEDICUS practitioner is one of a small group of Healthcare Professionals who has received extensive training in Vitality, Longevity and Healthy Ageing making them well equipped to help you achieve your goals. VLA is a system your Practitioner offers that gives them all of the tools to help you maximise you ongoing health and wellbeing. It includes a scientifically validated test known as Bioimpedence Analysis (BIA). The test interprets your results and records your progress, plus the VLA program offers a range of natural therapies and exercise to have you looking and feeling at your best. Need to lose weight quickly?Have you been feeling heavy, sluggish and uncomfortable? Are your clothes feeling tighter? Are you embarrassed about your size? Would you like to be much more active and energetic? We have the answer!Choose your ideal weight – we’ll help you achieve it. Guaranteed! Enquire via email or at reception NOW!